A man from Peterborough has been found unanimously guilty of attempting to murder his 82-year-old mother who is bedridden after suffering a stroke. Mark Calvert Elliott (54) of Wingfield, Orton Goldhay, initially told officers he was trying to send her “to a better place” by smothering her with his hands before changing his story and denying that he would have gone through with the act. However, family members entered the room when the attempted murder was taking place which prevented his mother from suffering any long-lasting injuries. Calvert Elliott denied the attempted murder charge but was convicted after a three day trial at Peterborough Crown Court. The incident took place on October 9 last year. 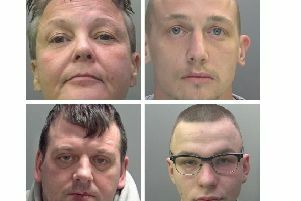 The jury heard a 999 call came in from Calvert Elliott at about 11.15pm to say he had just tried to commit euthanasia on his mother by suffocating her with his hands. He told officers how he wanted to send his mother, who is bedridden after a serious stroke several years ago, “to a better place”. He was arrested and later charged with attempted murder, however, in court he denied he was going to fully go through with the act. Detective Sergeant Rob Sansom said: “This was a truly sad case, however, Calvert Elliott’s actions could have resulted in his mother losing her life and that decision was not his to make. Calvert Elliott is due to be sentenced at Peterborough Crown Court on May 10.